Confessed technophobe Elton John told a British tabloid last week that the Internet is ruining music – but not for the reasons you’d think. It’s bloggers and homegrown music tweakers, not file traders, muddying the waters. “There’s too much technology available,” he continued. Perhaps unaware that wannabe pop stars can create mediocre Pro Tools projects without a network connection, he blamed the Internet for this state of affairs. “I do think it would be an incredible experiment to shut down the whole Internet for five years and see what sort of art is produced over that span,” he concluded. I beg to differ, Elton. The opposite’s true. I can’t attend every show I write about. There simply isn’t enough time. So I use the Internet. Between MySpace, YouTube, band websites, Rhapsody and iTunes samples and Sonicbids electronic press kits, I can be in several virtual places at once. But that’s simply a means to where I’m going to end up on Friday or Saturday night. Plus, with the Internet, I tend to find lots of good music not made by megastars playing venues large enough to hold the population of the town I live in. Maybe that’s what’s bugging him. 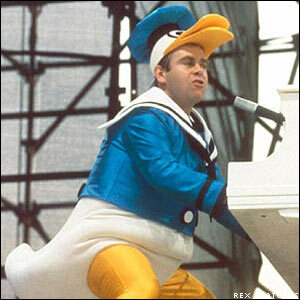 Sadly for Elton, the era of blockbusters is over. His recent “Captain and the Kid” was a good album, but it didn’t sell like “Captain Fantastic and the Brown Dirt Cowboy.” If he’s snippy about that, fine. Go on a $150 a ticket concert tour while you still can. But don’t whine that the information highway is the problem because it’s covered with cars – especially when you’re one of the main reasons people learned to drive in the first place. This tirade occurred only a few months after the entire Elton John back catalog became available for purchase on iTunes. OK, what’s the best way to keep it local this week? Thursday: Starline Rhythm Boys, Recreational Park (Chester) – This Vermont band, which plays honky tonk with Texas conviction, was born in a way that warms my heart. Their young leader thought punk rock would change the world, but his dad filled the house with Johnny Cash, Roy Orbison and Waylon Jennings. God bless those that give their kids a proper upbringing. Nothing beats a well-rounded musical education. This is a free show. Friday: Haale, Boccelli’s – Her name sort of rhymes with “Falls,” as in Bellows. Haale blends the traditional music of her parents’ homeland, Iran, with electric rock and the sounds of the New York streets. To call her unique is an understatement. She describes her sound as “Psychedelic Sufi Trance Rock.” Count as fans David Byrne, who showcased her in a series of NYC shows, and Sean Lennon, who played on her last album. The local connection is producer Dougie Bowne, who worked with Chris Whitley. Saturday: Whalestock, Whaleback Ski Area – This local music showcase features the return of a reconfigured Hexerei (who also play in Claremont earlier in the day, on Twistback Road at Lionel West). Also on the bill are Sarvela, who impressed me with their raw sound back in January, singer-songwriter Marisa Imon, Claremont’s Iron Box, and five other bands. As with last year’s inaugural Whalestock, the day includes an extreme sports competition, some fine craft beers from Shipyard and Gritty’s and all original music..
Sunday: Roxanne & The Voodoo Rockers, Newbury Bandstand – Lead singer Roxanne Young caught blues fever 10 years ago and switched her focus; she formed the Voodoo Rockers in 2002. With help from some fine area players, including former Voodoo Blues leader John Mann on guitar, the band’s been invited back to area bars like the Anchorage more than once. This free show (keep your fingers crossed for good weather) offers a chance for young and old to experience a little bit of the Delta on the lake. Tuesday: Chris Kleeman, Ludlow Gazebo – Another local blues man with a fine pedigree – his first album, made back in 1970, was produced by none other than B.B. King. A typical Kleeman set moves from the southern playing of Robert Johnson and Mississippi John Hurt, to the big Chicago sounds of Muddy Watters and Elmore James, with a little country pickin’ thrown in for good measure. Always a treat, and this is a free show, so what’s your excuse for not going?